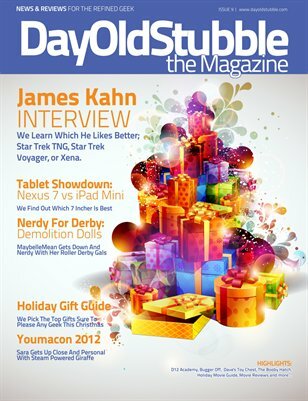 Issue 9 our Holiday Gift Guide is now available. Inside you will find our featured author interview with James Kahn who is well known for his novelization of The Empire Strikes Back as well as other famous geek movies. Our newest writer MaybelleMean gets down and nerdy with the roller derby girls from Demolition Dolls. Sara ventures to Youmacon 2012 and gets to hang with Steam Powered Giraffe. We also take a look at which 7" tablet is best, the Nexus 7 or iPad Mini. Our big Holiday Gift Guide is sure to have at least one thing that your favorite geek would like to have this Christmas. Dave goes over the Hasbro WWF line and Aaron is back with another D12 Academy about the game Citadels. Our movie reviews included Wreck It Ralph, Skyfall, and Ruby Sparks. That may all sound like a lot but there is plenty more that you will have to find out for yourself when you read our latest issue today.